Where are Olewo Pet Food Supplements made? Olewo is a brand of all-natural pet food supplements made with pride in Germany. There is very little regulation in the pet food industry and the way many companies label their products, it is often not clear where the product is actually made and where the ingredients were sourced. Olewo Pet Food Supplements are 1-ingredient products and we know exactly where they are made and sourced. We visit the Olewo manufacturer in Germany regularly and have walked the fields ourselves. The vegetables used to make Olewo Carrots and Olewo Red Beets are grown in fields dedicated to Olewo, and every step from growing to harvest and preparation is monitored. While many soils around the world are depleted, Northern Germany is known for it's extremely fertile soil. The premium vegetables grown in this fertile soil are more nutritious as if they were grown anywhere else, and they are harvested at just the right time when the nutrient levels are at their peak. They go into preparation immediately after harvest to assure maximum capture and preservation of the beneficial vitamins and nutrients. The vegetables grown for Olewo Pet Food Supplements have been tested to exceed farming standards for vegetables grown for human consumption. Can I prepare a batch of carrots ahead of time and then refrigerate it for several days? Olewo Carrots are meant to be prepared for each meal. The carrot pellets just take a few minutes to rehydrate in some warm water. We know several of our customers make up batches for up to a week ahead of time and keep it in the fridge, and they say it works just fine and they are seeing the benefits. But that is not the recommendation. Many of the benefits come from the beta-carotene in the carrots, and beta-carotene is sensitive to light, air and moisture. Once the carrots are rehydrated, the beta-carotene is exposed to all of that. Olewo Carrots are very rich in beta-carotene and if you kept rehydrated product for a week, it probably would still contain plenty of beta-carotene. However, if you need to make some extra ahead of time, we suggest not to keep it for more than a couple of days. 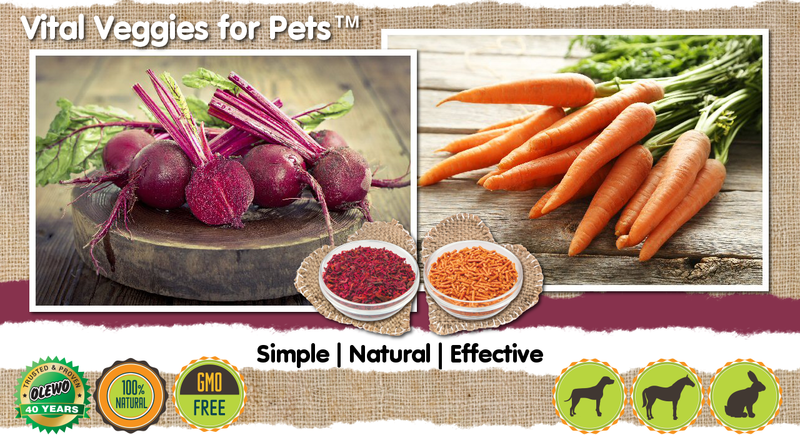 Can I give my dogs both, the carrots and red beets with their meals (morning and evening)? Your dogs can have one daily dose of each, the Olewo Carrots and Olewo Red Beets, which can be given with one meal or split between two meals. I personally feed the red beets with one meal and the carrots with the second meal of the day, and I think most of our customers do as well. However, you can feed it the way it is most convenient for you as long as you follow the recommended daily dosage. Some of our customers even mix and rehydrate the carrots and red beets together. Is it safe to feed Olewo to pregnant and lactating dogs?Olewo is safe to feed to pregnant and lactating dogs. Yes, it is safe to feed Olewo to pregnant and lactating dogs. Actually, that is a very important time to feed Olewo to help keep the dogs healthy. Olewo Red Beets for example contain an excellent amount of folate which is important for normal embryo development. The beets also keep inflammation down and detoxify naturally which helps ensure good health for lactating dogs. Olewo Carrots provide digestive support for great for gut health, keep the immune system strong, and protect against infections. The added nutrition will greatly benefit pregnant and lactating dogs. Yes, carrots are excellent for dogs because they provide added nutrition to help improve the overall health of dogs so they can be vibrant and thrive. Many of the health-promoting nutrients in carrots are the ones that are often lacking in commercial dog foods, and natural source vitamins are more effective than synthetic vitamins. How will my dog benefit from carrots? Carrots naturally help relieve common ailments such as dog diarrhea, digestive issues in dogs, dull coat and itchy dog skin. They strengthen the immune system to help prevent infections and disease. It is amazing how a little natural nutrition can improve the health of our dogs. Can I just feed my dog raw carrots? While most dogs enjoy chewing up raw carrots, they will not benefit from the many healthy nutrients because dogs cannot properly digest raw vegetables. What makes Olewo Carrots so effective? Olewo Carrots are easy to digest because they are properly prepared for dogs to absorb and utilize the amazing nutrition in carrots. Olewo Carrots are made from a special variety of carrot high in beta-carotene and are super nutritious because they are grown in Northern Germany which is known for it's extremely fertile soil. The carrots are harvested at just the right time when the nutrient levels are at their peak. They go into preparation immediately after harvest to avoid loosing any of the valuable nutrients. Olewo's proprietary method of forming highly nutritious carrots into a pellet form assures maximum capture and preservation of the beneficial vitamins and nutrients. Olewo Carrots were recommended for dog diarrhea. Does it really work? Yes, Olewo Carrots provide a source of premium fiber, and the naturally occurring ingredients in carrots are very effective against diarrhea in dogs. In most cases after just 2 feedings of Olewo Carrots, the intestinal lining is calmed, resulting in a quick cure from dog diarrhea. My dog always has loose stools. Do Olewo Carrots help with that? Yes, Olewo Carrots help firm up loose stools when used as a daily dog food supplement. While results can be seen after just a couple of days, Olewo Carrots should be added to the dog's meals daily to maintain a healthy digestive system. My breeder recommended Olewo Carrots. Does my puppy already need a supplement? Absolutely, a puppy's diet should be supplemented for a healthy start in life, and an all-natural food supplement is the best choice. The vitamins and minerals in Olewo Carrots help promote bone and tissue growth, and strengthen a puppy's important immune system to help prevent infection and disease, which they are very susceptible to at a young age. Olewo Carrots also help prevent diarrhea, which is especially important for puppies and young dogs because diarrhea can inhibit their growth. At what age can I feed my puppy Olewo Carrots? Olewo Carrots are easy to digest and a puppy's diet can be supplemented after 6 weeks of age, and even earlier in cases of diarrhea and in consultation with a veterinarian. The many breeders using Olewo, wean their puppies by adding Olewo Carrots to their kibble for digestive support, natural deworming, healthy skin & coat, and to boost immunity. I wish I had found Olewo sooner. Can it still benefit my senior dog? Absolutely, Olewo Carrots benefit dogs of all ages, and older dogs need about twice the normal amount of vitamin A. Olewo Carrots are loaded with beta-carotene, which converts to vitamin A, and have the extra vitamins and nutrients necessary to support declining immune and digestive systems, and to reinforce and extend vitality and stamina. Do Olewo Carrots really help de-worm? Yes, Olewo Carrots are a great natural dewormer because carrots contain a volatile oil that kills worms and parasites naturally, and the carrot fiber helps move the wast out of the intestine. Can Olewo Carrots help improve my show dog's coat? Olewo Carrots are loaded with beta-carotene, which converts to vitamin A, and vitamin A is essential for healthy skin and coat. Olewo Carrots also enhance coat color and help improve markings and pigmentation. When used as a daily supplement, Olewo Carrots provide the most amazing coat. How do I feed Olewo Carrots? Rehydrate the recommended daily amount of carrot pellets according to body weight of the dog in warm water and some oil added (refer to feeding chart on bag). The amount of water used for re-hydration can be adjusted depending on the preferred consistency of the final reconstituted mixture. Steep for 10 minutes and then mix in with the dog's regular food. Click here for images and step-by-step instruction of How To Prepare Olewo Carrots. Do I have to add the oil when re-hydrating Olewo Carrots? The addition of a small amount of oil (refer to feeding chart on bag) is recommended to help convert more of the beta-carotene to the beneficial vitamin A., but it is optional. Good oils to use are salmon oil, flax seed oil, organic coconut oil, but most kitchen oils will do, even olive oil. Oil should NOT be used when feeding puppy food or high performance dog foods because those foods already have a higher fat content, which is sufficient to aid the beta-carotene to vitamin A conversion. Can I add Olewo Carrots to raw dog food? Olewo Carrots can be added to any dog food whether it is kibble, canned dog food, raw dog food, or home-cooked meals. Can Olewo Carrots be fed separately? Typically Olewo Carrots are mixed in with the dog's regular food, but yes, a re-hydrated portion can be fed separately if desired. Yes, red beetroot offers miraculous benefits for the health of dogs that are still not commonly known. Red Beets are a nutritional powerhouse! They are high in nutrients and low in calories, and are among the best foods to add to a dogs' diet to make sure they can enjoy optimal health, be vibrant and thrive. I heard that beet pulp is just a cheap filler. Is that true? This is NOT beet pulp! Beet pulp comes from sugar beets and is the by-product of commercial sugar processing. Olewo Red Beets are made from red table beets that are grown for human consumption. Red beets are valued by many people as one of the best sources of healthy nutrients and powerful antioxidants to improve their health, and the benefits of this amazing vegetable can be utilized for the health of our dogs as well. How will my dog benefit from red beets? Red beets are a great natural detoxifier and anti-inflammatory, and help relieve common ailments such as skin allergies in dogs, dog scratching, dog itching, bumps on dogs, dog ear infection, and more. Red beets help boost metabolism and manage weight, and the antioxidant power of red beets helps prevent infections and disease. It is amazing how a little natural nutrition can improve the health of our dogs. Can I just feed my dog raw beets? While most dogs enjoy chewing up raw vegetables, they will not benefit from all the healthy nutrients because dogs cannot properly digest raw vegetables. What makes Olewo Red Beets so effective? Olewo Red Beets are easy to digest because they are properly prepared for dogs to absorb and utilize the amazing nutrition in red beets. Olewo Red Beets are made from premium red table beets and are super nutritious because they are grown in Northern Germany which is known for it's extremely fertile soil. The red beets are harvested at just the right time when the nutrient levels are at their peak, and then go to production immediately to avoid loosing any of the valuable vitamins and nutrients. Olewo Red Beets were recommended for skin allergies in dogs. Does it really work? Yes, Olewo Red Beets help relieve allergies in dogs through natural detoxification and by reducing inflammation when used as a daily dog food supplement. The betalain pigments in red beets effectively neutralize toxins, which are often the cause of allergies in dogs. My dog is always itching, scratching and licking his paws. Can Olewo Red Beets help with that? Yes, because the detoxification support red beets provide when used as a daily dog food supplement, unwanted toxins which are often the cause of an itching dog, get passed out instead of being re-absorbed in the dog's system. Just like humans, dogs are exposed to external toxins every day, including pollutants, pesticides, fertilizers, household cleaners and other chemicals. Other sources of toxins include medications such as steroids, antibiotics, vaccines, and even food toxins such as chemical preservatives, additives and coloring. My breeder recommended Olewo Red Beets. Does my puppy already need a supplement? Yes, a puppy's diet should be supplemented for a healthy start in life, and an all-natural dog food supplement is the best choice. Red Beets provide key nutrients for strong bones, normal tissue growth, healthy heart, and help protect the intestinal barrier with healthy fiber. The strengthen a puppy's important immune system and powerful antioxidant support helps prevent infection and disease, which young dogs are very susceptible to at a young age. At what age can I feed my puppy Olewo Red Beets? Olewo Red Beets are easy to digest and a puppy's diet can be supplemented after 3 months of age or even sooner. The only reason for introducing Olewo Red Beets a little later than Olewo Carrots is because red beets help speed up metabolism, which could cause some puppies to be overactive if introduced too soon. I wish I had known about Olewo Red Beets sooner. Can it still benefit my senior dog? Absolutely, Olewo Red Beets benefit dogs of all ages, and older dogs need more than the normal amount of vitamins and nutrients to help extend vitality and stamina. A premium source of fiber is important for older dogs, and the combination of antioxidant and anti-inflammatory compounds in red beets make Olewo Red Beets the ideal dog food supplement to help protect against disease and certain cancers during their senior years. Do Olewo Red Beets really help manage weight? Olewo Red Beets provide a premium source of fiber and help increase the nutrient absorption and proper digestion of the dog's food. The betaine in red beets helps stimulate the function of liver cells, and with a properly functioning liver, fats are broken down efficiently to maintain a healthy weight. Can Olewo Red Beets improve my dog's metabolism? Yes, red beets have a gamma-amino acid which plays an important role in maintaining efficient metabolism. How do I feed Olewo Red Beets? Add the recommended daily amount of red beet chips according to the body weight of the dog (refer to feeding chart on bag) to the dog's regular food, either dry or soaked briefly in water. Briefly soaking the red beet chips in water is recommended for better nutrient absorption. Click her for step-by-step instructions on HOW TO FEED OLEWO RED BEETS. Can I add Olewo Red Beets to raw dog food? Olew Red Beets can be added to any dog food whether it is kibble, canned dog food, raw dog food, or home cooked meals. Can Olewo Red Beets be fed separately? Typically Olewo Red Beets are mixed in with the dog's regular dog food, but yes, a portion of red beet chips can be fed separately, either dry or moist if desired. Can I feed Olewo to my cat? Olewo Carrots and Olewo Red Beets can be given to cats for a boost in immunity or to help with common ailments, but only for the short term. Cats are carnivores and the percentage of vegetables in their diet should be very small. Too high of a percentage of vegetables (same applies to cat food) can change the chemical composition within the cat’s body and cause urinary tract issues. We know of shelters that use Olewo with cats and they say it is the only product that has ever really worked to nurse them back to health. Again, it works great when cats need a nutritional boost, but only use for the short term. You can feed it for a month at a time 2 or 3 times a year, or as needed when your cat has an ailment.